JOIN US AND "GIVE BEES A CHANCE"
YOUR SUPPORT WILL HELP FUND CRUCIAL FIELD TESTS ACROSS WASHINGTON STATE. Although CCD is not fully understood, it appears to be a destructive synergism of multiple factors. 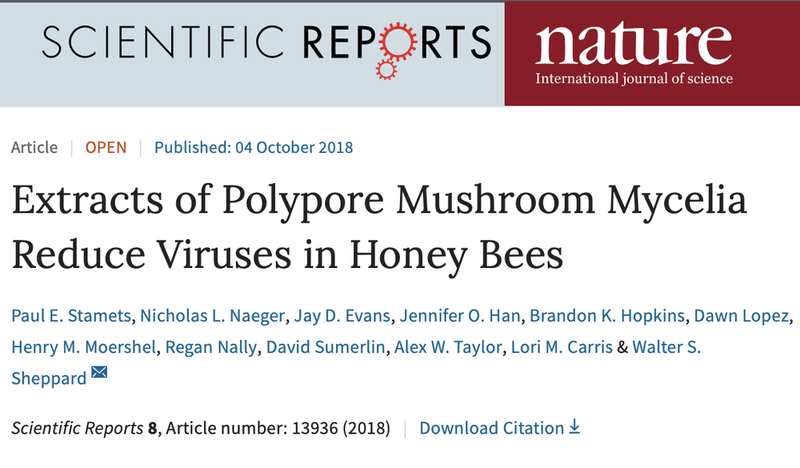 Pathogen (bacterial & viral) infection harms bees already challenged by other stress factors: parasitic mites, pesticides, fungicides and GMO exposure. These stressors of infection, parasitism, toxins, and immune deficits/depression may initiate CCD. In 2014, Paul Stamets (leading mycologist, visionary and TED Talk presenter), Steve Sheppard (chair of department of entomology, Washington State University) and the Washington State Beekeepers Association teamed up in a research initiative called BeeFriendly™ to help reverse devastating declines in the global bee population that are critically threatening the world’s food security. In 2015, 300 sets of bees consumed Host Defense® mushroom extracts via their feed water. The experiments were designed to measure how mushroom extract supplementation impacted viral burdens and longevity. “We take bees from colonies with high Varroa mite levels and set up numerous test environments with fungi. We’re finding that the fungi product is killing mites without harming bees. It’s certainly encouraging.” says Sheppard. Click the image below for the Nature Scientific Reports article about the extract.